The Southampton Tennis Club was started by Foss Warder in 1956. This family tennis club at times seems to be the lifeblood of Southampton Ontario with members playing and watching tennis all summer long. Because of the strong youth tennis program and active membership Southampton has fondly been named Tennis Town Ontario. 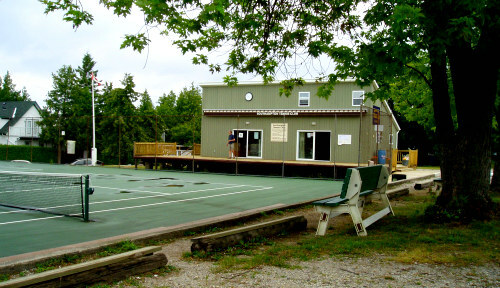 There are 15 courts throughout the town of Southampton with the main club or Beach Courts found on Lake Street. The Beach Courts are home to the week day tennis lessons for ages 5 to approximately age 12. In truth you are "moved up" from the junior lessons to the intermediate lessons at the discretion of the instructors. Junior lessons are Monday - Fridays in July and August. There are usually 2 rounds of lessons one at 9 and one at 10. In order to be eligible for lessons you must be a member but there are extremely flexible membership plans that start at weekly and expand to the whole summer depending on your availability. Members then place their tag on the board and are called out to a court for their lessons. Each lesson ends with the serve and the kids yelling OVERHAND and UNDERHAND! 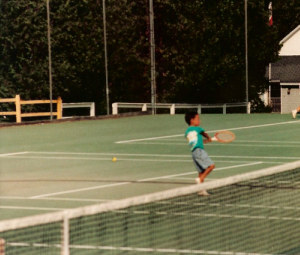 Intermediate lessons are held at the two "Uptown Courts" that are found in an alley off HWY 21. These lessons build on the ground strokes centric junior lessons and focus on technique and game play. Adult lessons follow the junior lessons at the Beach Courts as well as "the bench". From 10 am to 1pm if you want to play the bench just put your racquet down in line along the courtside benches and play with other members when the next court comes available. It is a great way to socialize with other tennis enthusiasts. Weekly round robins for all levels of play are also held. Junior and Intermediate round robins are held on Tuesdays with the Juniors at the beach courts and the Intermediates at the Warder Courts. Adult round robins are on Wednesdays at the Beach Courts. The Warder Courts once known as the boonies have become a more active part of the Southampton Tennis Club. This site has 8 courts and now houses a second clubhouse. The Cups Tournament is held annually and runs through August. Memeber play in traditional divisions such as Mens Singles and Ladies Doubles, but there are also more creative slots like Brother Sister or Father Son divisions. It all leads up to Cups Day, the last Saturday before the long weekend, which has the final matches of the day and a ceremony in which awards are handed out to tournament winners as well as for categories like most improved player. Cups Day marks the end of the summer for many of Southampton's cottagers. Many generations have grown up playing tennis at the Southampton Tennis Club and keep coming back because of the strong family values at the club. Tennis Town Ontario indeed! Return HOME from Southampton Tennis Club.